The fifth child and third son of Mr. Thomas May and his wife, Mary, Daniel was born at his parents home, the Mill House, at Brimpton in Berkshire, on 22nd December 1770. He was named after his uncle, Daniel May of Pangbourne, who died only two years later. Daniel Junior grew up in rural Brimpton, playing in the fields of the Kennet Valley, as a young boy, some way below the little hilltop village. As a prosperous businessman, Thomas May was keen to obtain a good education for his children and Daniel would probably have attended school in Newbury or received private tuition with his siblings closer to home, perhaps from the local curate at Brimpton Vicarage. As a young lad, he, no doubt, began to help out at his father’s mill and would soon have learnt much about the milling trade. He may have become apprenticed to his father, or possibly to his uncle, William, who owned nearby Burghfield Mill. Certainly, Daniel was groomed to be a miller; and, in 1797 or soon afterward, his wealthy father appears to have purchased for him the mill at Sonning. Daniel must have known the buildings well from the time when it was run by his father's second cousin, Robert Woodroffe. He immediately moved into the handsome Aberlash House (the Mill House) on the island in the Thames (actually just over the county boundary in Eye & Dunsden); and must have been quite the young man about town, at the age of only twenty-six. He was described by his contemporaries as the handsomest man they knew and this was apparently confirmed to later generations by his unusually good-looking "shadow” portrait. Though, perhaps, not so obvious from his later portrait (see above). Daniel set about using the knowledge, he had spent years acquiring, to build up a milling business to rival that of his own father, who sadly died only three years later. Soon, however, Daniel had his own family to think of. On 28th November 1804, he married Eleanor Barnard in Sonning Church and their first child followed under a year later. Daniel did not lend himself to anecdote, but it is recorded that he travelled down to Southampton to see Nelson's ship, the Victory, towed into harbour after the Battle of Trafalgar. The decks were still stained with blood. This must have been somewhat shocking to a man who was very silent and reserved, mild in disposition, who never spoke a word in anger. He was a good church-goer and, in 1818, volunteered the use of his barn, adjoining the Smithy in Sonning, for use as a Sunday School. 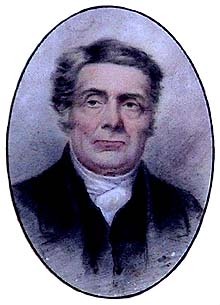 He also sold some of his land for the founding of Sonning Girls' School in 1835. Eleanor was altogether a more out-going character. The care and training of their children was left in her hands and, though a small lady, she was quite able to chastise them, when necessary. Her husband was, however, certainly not a feminist and used to say that he did not see what need women had for money. He was adored by his family. A most kind and liberal father, Daniel was, likewise, devoted to his eight children, though perhaps slightly more so to his sons. When they were away at school in Hounslow, he would travel up to Middlesex and take them out to an old coaching inn, where he would order buttered toast until they stopped him. He took his daughters on trips much further a-field: across the Channel to France several times. Daniel was evidently an astute businessman, like his father. He sold corn in Henley and Reading and sent produce to a wider market using a fleet of barges which he ran on the Thames, saving greatly on the exorbitant cost of corn freightage. There were some 170 barges plying their trade along the Thames in Daniel's day and he owned some of the biggest, such as the 37-ton 'Charlotte'. His flour was popular in London as well as locally. He was also the Sonning Lock Keeper and employed some eleven men at the mill and on an additional one hundred acres of farmland. However, he largely lived the life of a quiet country gentleman. He was very fond of horses and greyhounds, but gave these up as an act of self-denial, when his family grew up. In his later years, the mill was managed by his youngest son, Morgan. Daniel had a great friend in Perry Watlington, a wealthy bachelor of the ancient family of that name from Reading. Mr. Watlington promised Daniel that he would leave him his whole estate, valued at some £50,000. Daniel, however, predeceased his friend; but on his death-bed, he sent to Perry and reminded him of his promise, asking him not to forget his children. Perry promised that he would indeed remember them, and so he did. When he died, Mr. Watlington bequeathed each of Daniel’s eight children, £1,000. Daniel died at Sonning Island on 13th September 1851, aged nearly 81, and is buried on the edge of Sonning churchyard, as near to his old home as was possible. A handsome tomb chest memorial covers his last resting place, and that of many of his family. After his decease, his property was divided - according to the wishes laid down in his will - between his three secular sons. Unable to buy out his elder brothers, Morgan was forced to sell the mill and emigrated to the United States soon afterward.